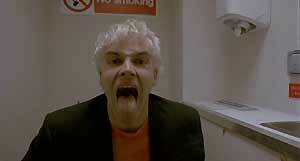 It's hard to think of a film that had more impact here in the UK during the 90s than Danny Boyle's Trainspotting. The film was based on a novel by Irvine Welsh, about a group of young people struggling with relationships, unemployment and drug addiction. The book and - especially - the film effectively captured the zeitgeist at the tail end of eighteen years of Conservative rule, and seemed to provided a voice for a disenfranchised subset of the population for whom climbing the social ladder would have meant a step up from using to dealing. The novel was published in 1993, and quickly became a cultural phenomena, spawning a stage adaptation, and, in March 1996, a hugely successful movie, directed by Danny Boyle (who later directed The Beach and 28 Days Later). The film broadened the novel's audience considerably, and launched a flood of official and unofficial merchandise, including the year's must-wear T-shirts, and a pair of best-selling soundtrack CDs. The film was helped enormously by an innovative, aggressive, iconographic poster campaign and a punchy trailer, both of which were widely imitated and parodied. Indeed, their influence can still be seen today, nearly a decade later. 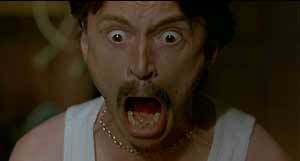 The film, which cost £1.8m, became a cash cow for distributors Polygram, which, over the years, was milked by various collector's edition-type VHS versions. The film also elevated several of its stars to A-list status, and helped to open doors for many of its less prominent cast members (the very deserving Kelly McDonald, for example). The film was even a huge hit in the US, where subtitles helped to decipher the more impenetrable sections of Edinburgh burr. It opened on a mere eight screens, but went on to gross more than $16m. The DVD's anamophic 1.85:1 transfer is very acceptable, with good contrast and detail. It's tempting to remember the film as having a subdued and grimy palette, but in fact the film is peppered with bold splashes of colour, which are nicely captured on the DVD. There's a smattering of (positive) film and negative dirt artefacts throughout the print, but nothing too distracting. Edge enhancement is present, and frequently results in aliasing (jagged diagonal edges) and ringing on areas of high contrast. There are no obvious signs of MPEG compression or excessive video noise reduction, though. The layer change is poorly situated, and interrupts a music cue. The disc's average bitrate is a very high 8.85Mb/s. One more observation: there's a lot of film weave (slight movement of the image inside the frame). It's not something most viewers are likely to notice under normal viewing conditions, but it can be distracting. There are also slight hops on many of the cuts, which is a problem that perhaps should have been addressed. Purists will be happy that the film's idiosyncratic subtitles (during the disco scene) and other captions ("the worst [Toilet] in Scotland") have been retained (and aren't player-generated subtitles). Unfortunately the disc prohibits the use of the popular "bookmark" facility which some players offer. 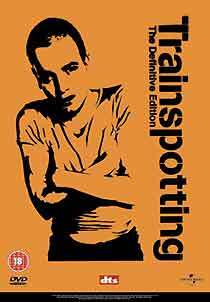 Early VHS releases of Trainspotting had 14" of BBFC cuts to a scene where Renton injects himself with heroin, but these were waived and the footage was reinstated in 2002. This DVD version of the film is uncut. Two audio options are available: a full-bitrate DTS version (at 1536kbps) and Dolby Digital 5.1 version (at 448kbps). A sampling of both versions indicates that the differences are subtle, but the DTS version offers better definition and separation. Both versions are clean, and offer good fidelity. Universal's two-disc Trainspotting - The Definitive Edition very nearly lives up to its billing, offering more than anyone with a passing admiration for the film will be willing to absorb, and almost enough to satisfy it's most dedicated fans. Some of the supplements, including nine deleted scenes and the commentary track, have been available before, but these have been supplemented with a lot of newly-shot material. A 1997 essay by Irvine Walsh about the film, commissioned for the 1997 Criterion laserdisc release, is featured in a very attractive fold-out booklet supplied with the DVD, incidentally. The first disc contains the film, the commentary track and a ten-minute featurette, The Beginning, which includes contemporary interviews with various cast members, and some clips from the film which show how bad it might have looked, if Universal hadn't re-mastered it. Disc one has an option to watch the film with Follow-The-White-Rabbit-style branching, where a scissors icon will appear on screen to denote the availability of a deleted scene. These sequences are, unsurprisingly, of inferior quality, and often look roughly-assembled, but at least are anamorphic, and so there's not a jarring jump in aspect ratio each time one appears. 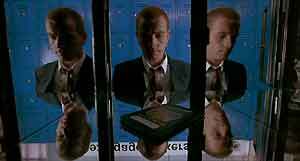 A menu option allows access to each deleted scene separately, with or without commentary from Danny Boyle. Annoyingly, there's no "play all" option for the deleted scenes, which means watching all nine, with and without commentary, is very fiddly. 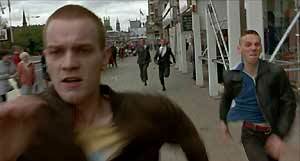 The deleted scenes includes choice moments like Renton's attending a job interview, where he admits to a serious drug habit, and two scenes which reveal the fate of Swanney (Peter Mullan). None of the deleted scenes add much to the story, but most of them are nice character-building moments. Several, it seems, were only removed because of an overriding desire to keep the film about ninety-minutes long. It's also noted that it's difficult to keep track of so many characters, and include a suitable conclusion for each of them, in such a short film. 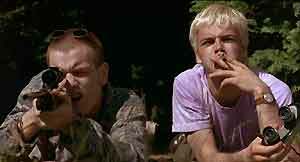 In Trainspotting, as in life, people often drift away before you've noticed they're gone. The film's commentary track was recorded in 1996 for Criterion's NTSC laserdisc release. Criterion rarely licenses its disc content to other companies, although they seem more flexible about releasing it outside the US, so getting the commentary is something of a coup for Universal, and a boon for fans of the movie, who might otherwise have had to hang on to their laserdisc version. The track, by Danny Boyle, producer Andrew MacDonald, writer John Hodge and star Ewan McGregor, is exemplary, offering plenty of information about the production process. It reveals how some decisions were forced on them by the lack of budget (the scene of Renton and Sick Boy in the park would have been more elaborate, if they'd had the money to license the Mission: Impossible theme, for example), and about how the book was changed quite radically from the novel, whilst retaining its essence. Then: A contemporary interview with Production Designer Kave Quinn, showing scrapbooks that were used as inspiration for the look and feel of the film (4m). 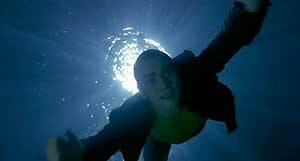 Now: Interviews from February 2003, with Danny Boyle, Andrew MacDonald and John Hodge, paying tribute to Quinn's work (3m). Now: More 2003 interviews, discussing the effect that the film had on the popularity of the songs, and the artists involved (5m). Interviews with Irvine Walsh, (5m, shot during the filming of his cameo), John Hodge (8m, on adapting the novel for the screen, and his subsequent career), Danny Boyle (11m, on all sorts of subjects, including casting the lead actors; the portrayal of drug use in the film; it's critical reception; and how he's tried not to cash in by repeating Trainspotting's formula) and Andrew MacDonald (10m, reflecting on the marketing and release of the film, and its subsequent effect on the British film industry). The Danny Boyle interview contains a deviously-hidden Easter Egg: when Boyle talks about Muriel Grey, pressing "enter" leads to a selection of press reviews (including a nice cartoon of Robert Carlyle). Six minutes of behind the scenes footage of the controversial scene where Renton injects himself with heroin. The footage is presented three ways: the raw footage, Danny Boyle watching the footage and offering commentary, and both together. (Actually there are six options: all of the above either full-frame, or, rather pointlessly, in a small box on the menu screen). This section also offers a 30" clip of Ewan McGregor, discussing the Calton Athletic Boys, reformed junkies who acted as technical advisors on the film. Red carpet reactions from Martin Landau (1m), Noel Gallagher (2m), Damon Albarn (1m) and Ewan McGregor (1m). Cannes Snapshot - two minutes of footage from the Cannes Trainspotting party, including contributions from The Sixth Sense's Toni Collette, critic Jon Ronson, musician Dave Stewart and Miramax head honcho Harvey Weinstein. The Teaser Trailer (1m, which features some especially-shot footage of Ewan McGregor tied to a railway track)) and the Theatrical Trailer (2m, including a censored version of the "Choose..." speech). Both are presented in full-frame format, and are of relatively mediocre quality. The second disc also offers very brief text biographies for most of the cast members, and the key production staff, and a montage of Polaroids, set to Sleeper's cover version of Blondie's Atomic (5m). The array of bonus materials offered is impressive, but it's not Definitive. Earlier releases included a related music video (for Underworld's Born Slippy), and an extended selection of deleted scenes, which were accidentally added to the first pressing of one of the VHS box sets. However, what has been included should satisfy most viewers. In addition to a fair amount of contemporary behind the scenes footage, three key contributors (Boyle, Hodge and MacDonald) have made themselves available to offer a lot of new material. The commentary track can't be faulted, and adds Ewan McGregor's voice to the mix. It would have been nice to see something from a more objective perspective, however: a short featurette on the film's enormous cultural impact, perhaps. Contributions from some of the more neglected cast members would also have been welcome. Niggles aside, Universal's Trainspotting - The Definitive Edition deserves to be in the collection of any serious film fan, or anyone who grew up as part of what we may yet come to call the Trainspotting generation.